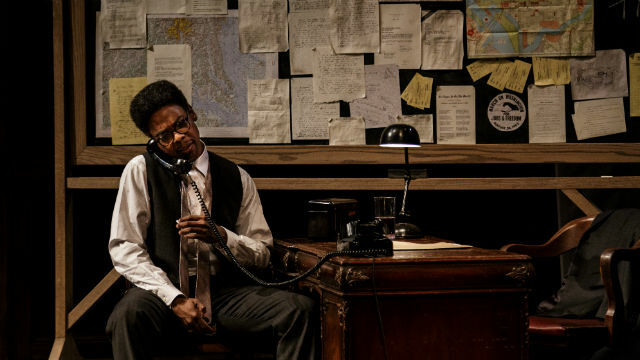 Michael Benjamin Washington as the civil rights leader Bayard Rustin in “Blueprints To Freedom” at the La Jolla Playhouse. One part inspiration, one part indignation. “Blueprints to Freedom: An Ode to Bayard Rustin” is about the lead-up to the 1963 March on Washington for Jobs and Freedom. The brilliant ‘prophet for social change,’ he who taught Martin Luther King Jr. non-violence, served as Deputy Director and Chief organizer/architect of the March, the biggest protest ever seen in America to date. But more than once, Bayard Rustin was sidelined by Civil Rights leaders, relegated to the shadows, ultimately becoming a footnote to history — because he was homosexual. The play had its first reading at the Playhouse in 2013, for the 50th anniversary of the March. It continued to evolve here, and was workshopped in the DNA New Works series. That version was plagued by long exposition and didactic passages. Though the new incarnation is fleeter, tighter and more personal, the beginning still bogs down, for the same reasons. Overall, though, the piece is startling at times, both incendiary and important. Rustin was a major player, and he should not be forgotten. In the play, his interactions with Reverend King are the most exciting and energized. But we also get to meet his (fictional) female assistant, who is there to encourage the inclusion of women in the March and on the podium. Rustin himself was backgrounded because he was a brief early member of the Communist Party and, in 1953, was arrested with two young men for “sexual perversion” in Pasadena. He was not invited to the White House reception following the March, despite his close and frequent interactions with Bobby Kennedy. We also meet Rustin’s former lover (a white man), and the 75 year-old mentor who stood by Bayard, and made him co-founder of his A. Philp Randolph Institute. And we’re privy to Rustin’s crisis of faith, when he can’t seem to hear the word of God to inspire him and move him forward. It also bears mentioning, though this factoid doesn’t appear in the play, that in 2013, President Obama posthumously awarded Rustin the Presidential Medal of Freedom. Judging by the drama and the documentary, Rustin was an impulsive, aggressive, sometimes belligerent provocateur. But, given the two months he had to organize the March, he certainly knew how to make things happen and get things done (“I love organized chaos,” he confesses). More than 200,000 people showed up for the March, and those who appeared on the podium were major players in the American landscape of civil rights, politics and music. Once all the exposition is out of the way, the buildup to the Big Event is gripping and enthralling. The shocking aftermath is, too. But the ‘indignation’ comes in how much we’re still having the same conversations today as we were 52 years ago: voting rights, employment equality, decent housing. Some things never seem to change. This realization, and the play’s somber ending, may leave you with a heavy heart. But your mind has been enlightened. And maybe, the playwright hopes, that will inspire you to action. The Playhouse production is superb. Washington’s performance is riveting; he plays Rustin with humor, intelligence, total commitment and impressive verisimilitude. Ro Boddie is outstanding in his portrayal of Dr. King. Mandi Masen is excellent as the awed and emotional but assertive Miriam Caldwell, Mat Hostetler is compelling in the small role of Rustin’s ex-lover, Davis Platt, Jr. And local favorite Antonio “TJ” Johnson, who was brought in late in the process, creates a powerful presence as Randolph. Lucie Tiberghien’s direction, and the work of her design team, are exceptional, including the first-rate all-wood set with upstage reflecting pool (Neil Patel) and the evocative projections (John Narun). The sound (Joe Huppert), lighting (Lap Chi Chu) and costumes (Beth Goldenberg) provide exemplary support. With a little script-tightening, this co-production with Kansas City Repertory Theatre will be ready to march across the country, and spread its significant story. Performances are Tuesday-Wednesday at 7:30 p.m.; Thursday-Saturday at 8 p.m., Sunday at 7 p.m. and Saturday-Sunday at 2 p.m.